1. 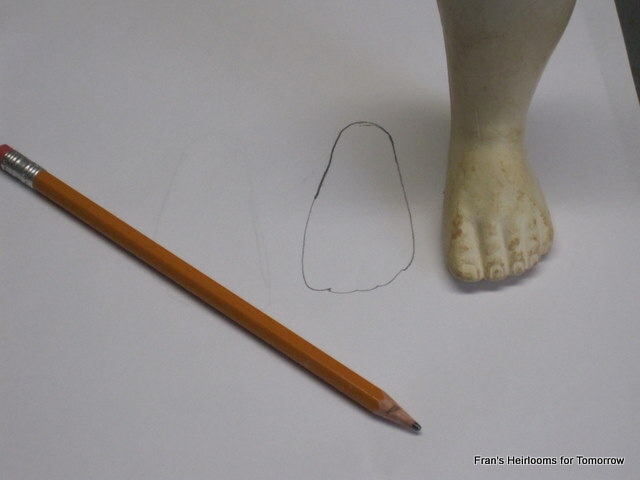 To start, trace your dolls foot onto a piece of paper. Hold the pencil at a slight angle so you do not add too much to the foot. 2. Then measure the length by putting a ruler down the longest part of the foot. (Send picture with ruler for comparison). 3. For the width measure the biggest part side to side. (Send picture with ruler for comparison). 4. When you do the toe box area go all the way around the foot at the biggest part of the toe area. You can round this off to the the next little line on the tape measure if you will have thick socks. Measure carefully, and do plan on what socks you will use and put them on and remeasure, if need be. 5. For the ankle go all the way around, and once again be mindful on the socks you plan on using. Always know how tall your doll is, or what body she may be on. Some dolls have small feet or big feet in proportion to their height, that is useful information if your trying to fit a hard size.